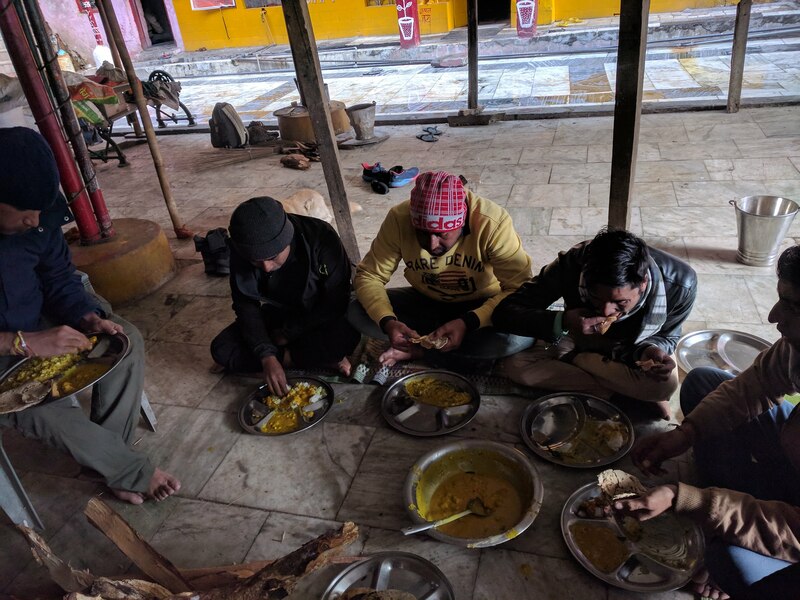 During winters, the hotels do not have adequate staff to take care of the few rooms that are kept open. The room in which Mahavir and Gautam slept smelt a bit funny. Mahavir, who was in general a very well-dressed, cleanliness-seeking guy, complained about the smell. There wasn’t much that could have been done. We had our breakfast and parted ways with Gautam. He had to return back to take care of one of his relatives’ son. Mahavir, Shubhajit and me started for Yamunotri at 9:30 AM. 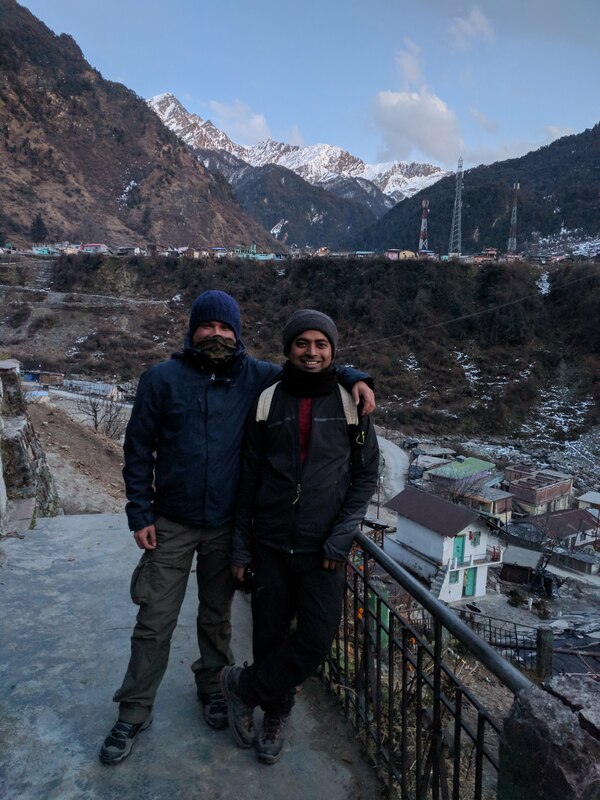 Mohit had scared us with his estimate of the hiking times—four hours to ascend and four to descend. 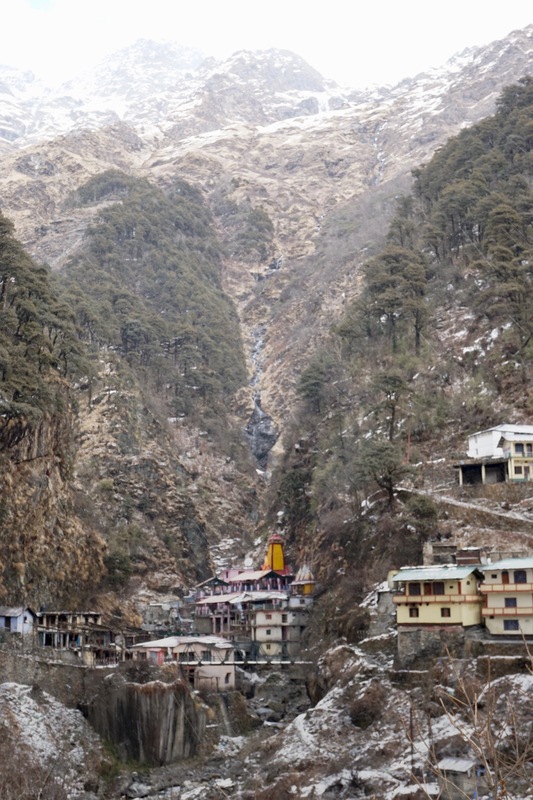 Yamunotri was six kilometres from that place. In general, it is not always possible to predict hiking time in hills as it depends on the gradient and the terrain conditions. We took his words at their face value. 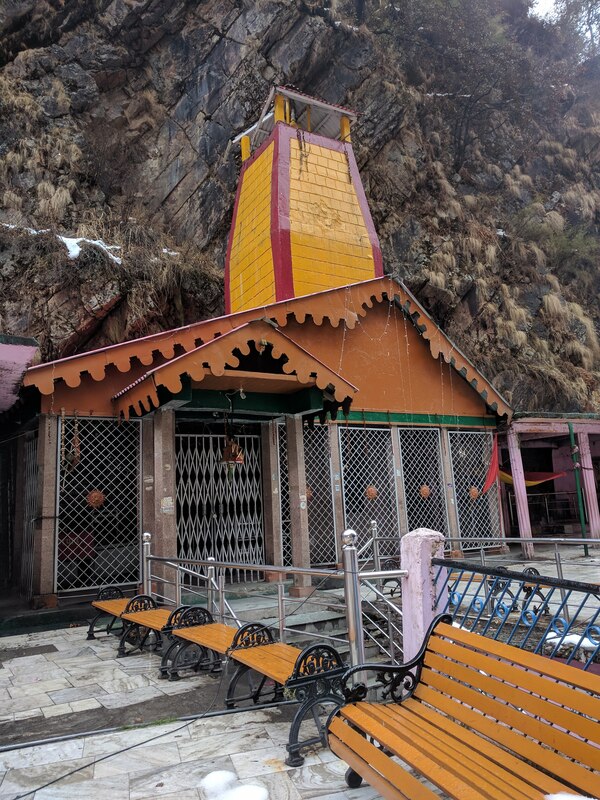 Yesterday, a group had returned from the one-and-a-half kilometre mark from Yamunotri. A group of Hariyanvi guys—two of whom were from the police department—left about forty-five minutes before us. Just as we started, we noticed foggy, white clouds that covered the top of the mountains. The well-built, wide, concrete road passed through closed lodges, deserted amenity centres, empty areas and bamboo skeletons of shops that would be bustling with activity during pilgrimage season. For a long time, we were the only ones walking. Well, technically not—two dogs had accompanied us right from Mohit’s dhaba. The road was littered with construction material. Some of the railings and seats were getting a face-lift. These would be cleared before the season opened in May. 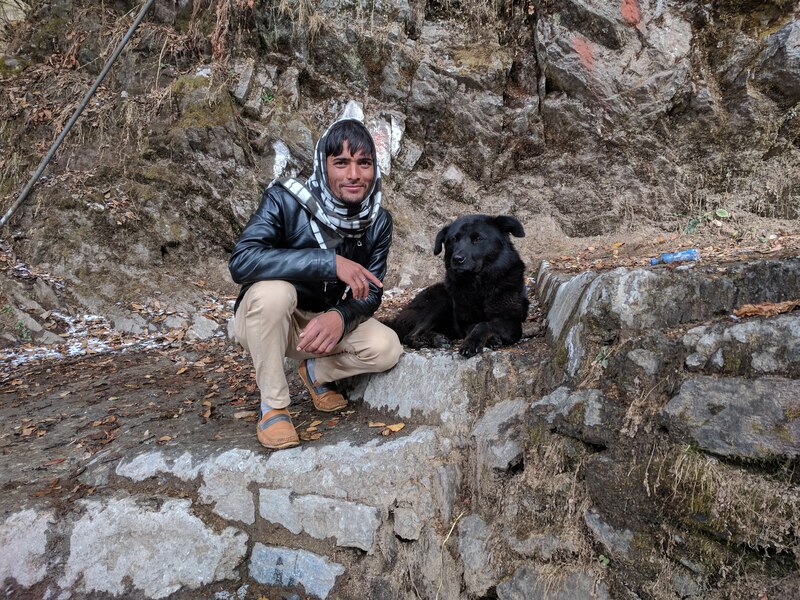 Mahavir with one of the dogs that accompanied us all the way to Yamunotri and back. 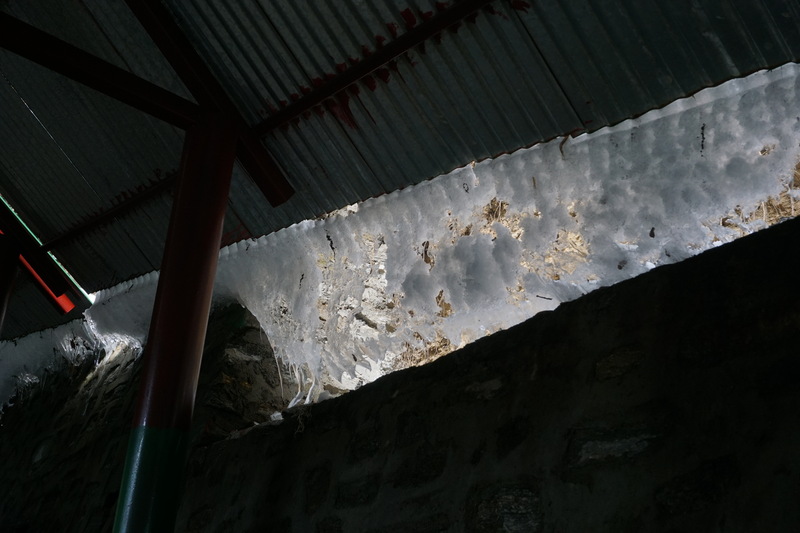 Accumulated ice sliding off like a fluid through the corrugated channels of the roof. Out of nowhere, the cloud moved right over our head and it started to snow. It snowed for a very long time with varying intensity and did not stop until late afternoon. Somewhere along the way, we crossed the Hariyanvi gang. We were at the temple at 11:00 AM. Mohit had given us a wrong estimate. Even the Hariyanvi gang, who walked slower and took longer breaks, reached there in another half-an-hour. 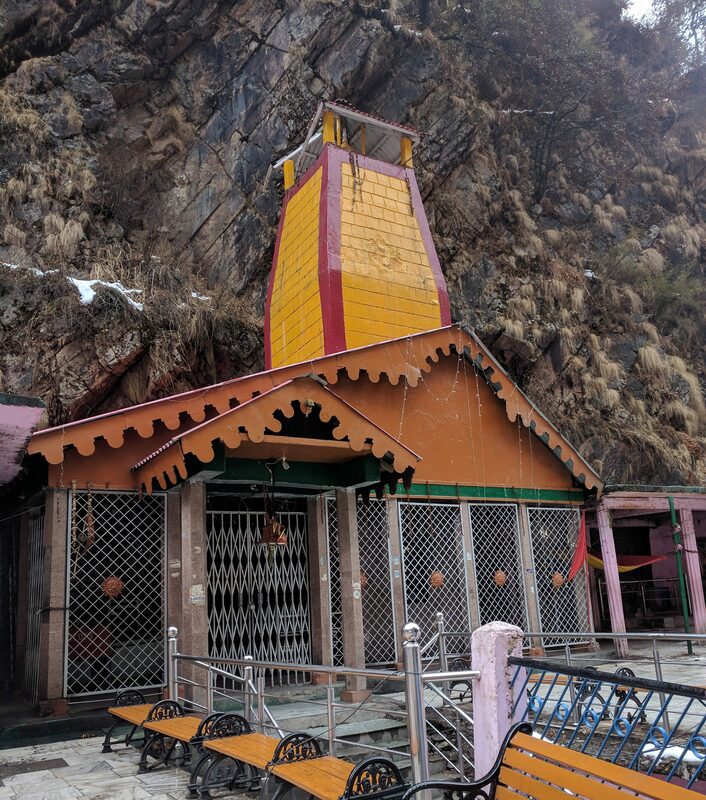 Yamuna temple against a backdrop of the majestic mountains got showered with snow. The actual Yamuna temple was empty. We had already seen the idol at Kharsali. Sita Ram Lakhsman Hanuman Temple, the other temple in the compound, was open. When we entered, the residential pandit, whom everyone addressed as Maharaj, was cooking something. He offered us tea and some left-over sweet-pancakes for breakfast. Mahavir did not want to eat before taking a bath but both me and Shubhajit gulped down one each. Once the Hariyanvi guys were there, they made some more tea for all of us inside Maharaj’s kitchen. It was so sweet that I couldn’t take more than three sips. Hariyanvi’s are known to make khhadi chammach ki chai (standing-spoon tea)—tea with so much sugar that a spoon can stand erect in the glass. 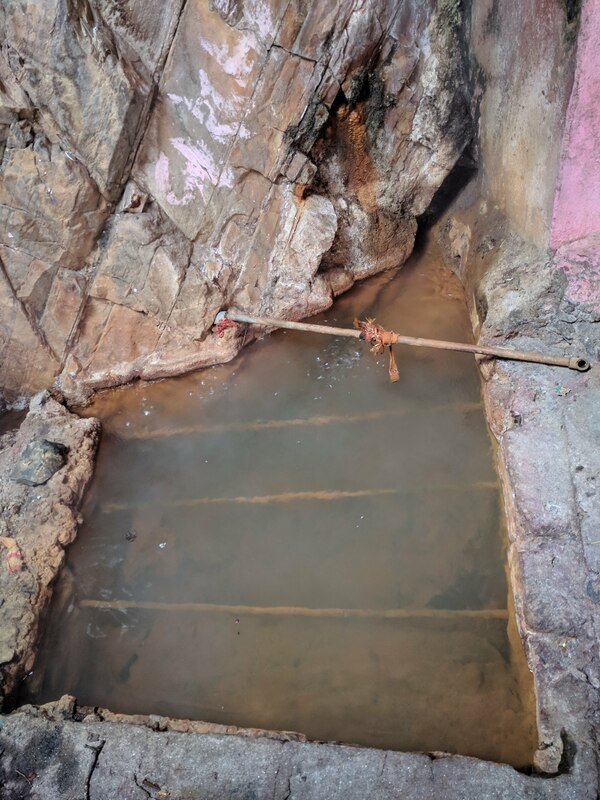 A public bath inside the temple area feeds itself from Surya Kund—a hot spring that is so hot that one could cook grains and pulses—and Yamuna’s cold waters to make the temperature manageable. Coming from that freezing cold outside into the hot bath was too much of a thermal shock for me. But I must say that once I was inside the bath, I did not feel like getting out. We must have spent about an hour inside. 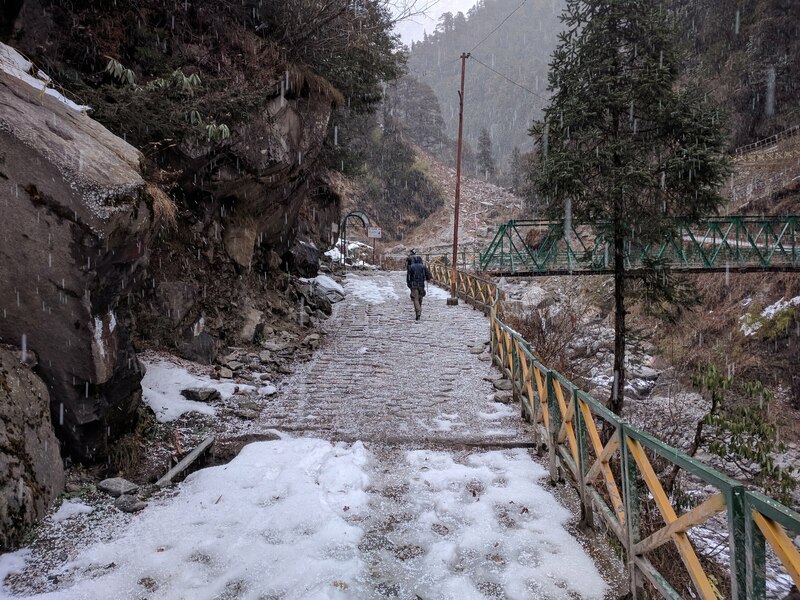 According to Shubhajit, we were enjoying what big shots spend thousands of dollars to achieve—a nice dip in a hot-tub spa while enjoying a snowfall outside. 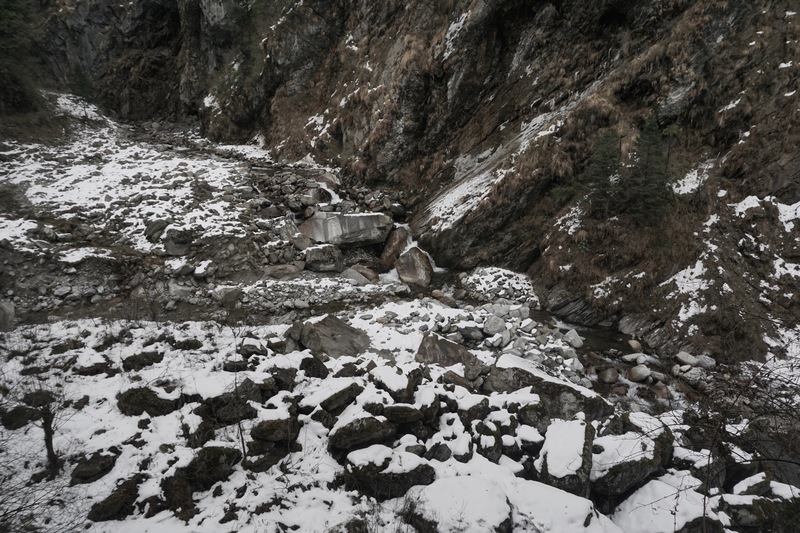 Surya Kund, the hot spring that is the source of hot water for the bath. Once we were back inside the temple, we found Maharaj reciting Sundarkand of Ramayan. We sat there while two of the Hariyanvi guys and Mahavir went inside the kitchen to make some rotis. Once the recitation and the offerings were over, Maharaj gave us some rice and kadi he had prepared earlier. Us and the Hariyanvi guys enjoyed some excellent kadi with Nutrela (TVP). We weren’t able to meet Bharat Das as instructed by Raghavanand pandit yesterday. 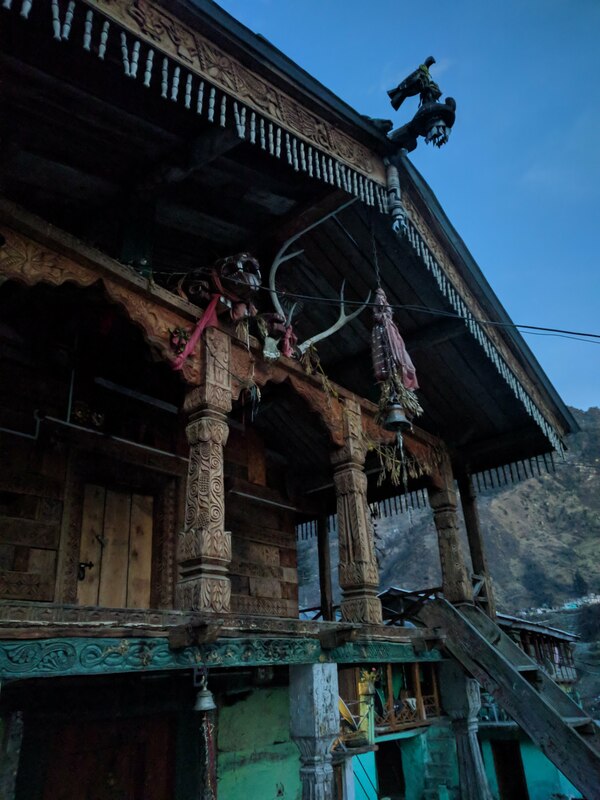 Maharaj appeared to be his disciple, who in turn was the disciple of an ascetic who had migrated from Nepal and stayed there for fifty-one years—not even crossing the bridge that was adjacent to the temple—until his demise in last July. Maharaj himself had come from Madhya Pradesh and had been residing there for nineteen years. Strangely, he always spoke of himself as a duality of spirit and body. He said that his body had migrated to that place when he it had embarked on a journey during college. 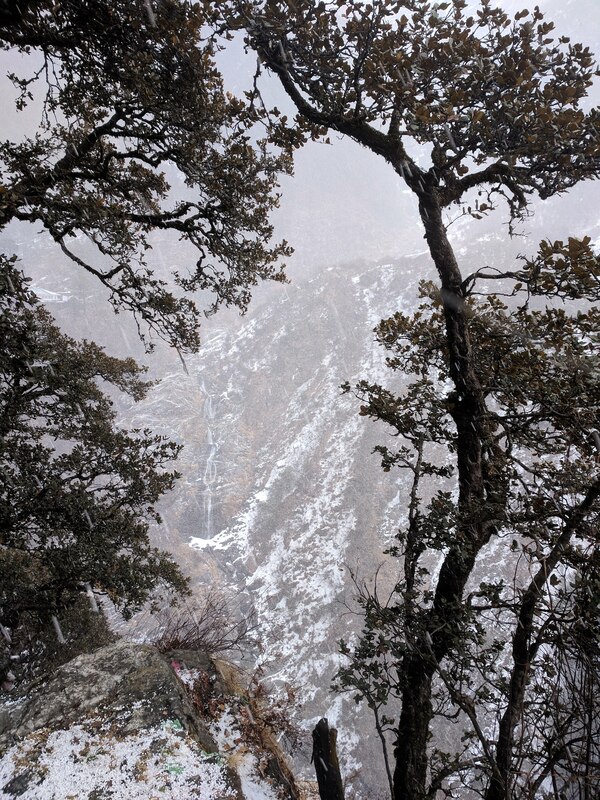 It took us even less time to descend—probably under an hour. Once we were at Janki Chatti, we roamed around the village. A few kids, who hadn’t had time to switch from their school uniform, were playing cricket with a ball made of socks. Another kid “drove” a car that was more of a wireframe depicting two wheels and a steering wheel. Someshwar temple inside the village. 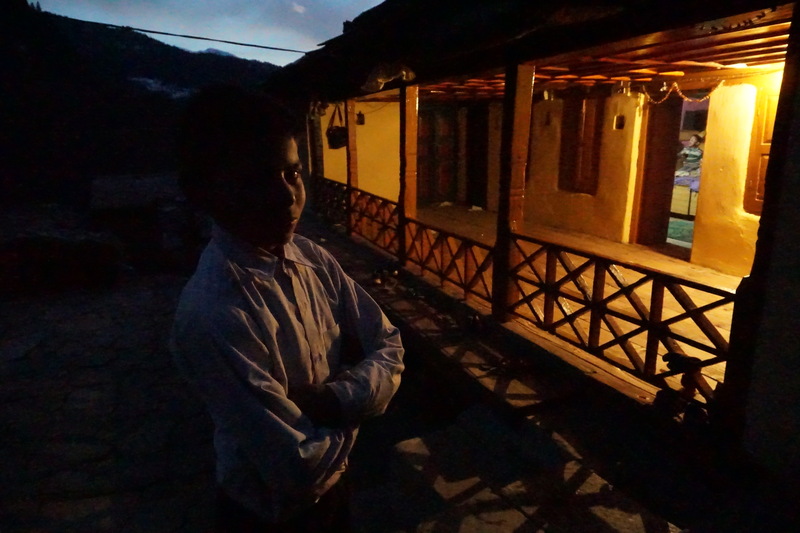 One of the kids, who was playing cricket, posed in front of his house. 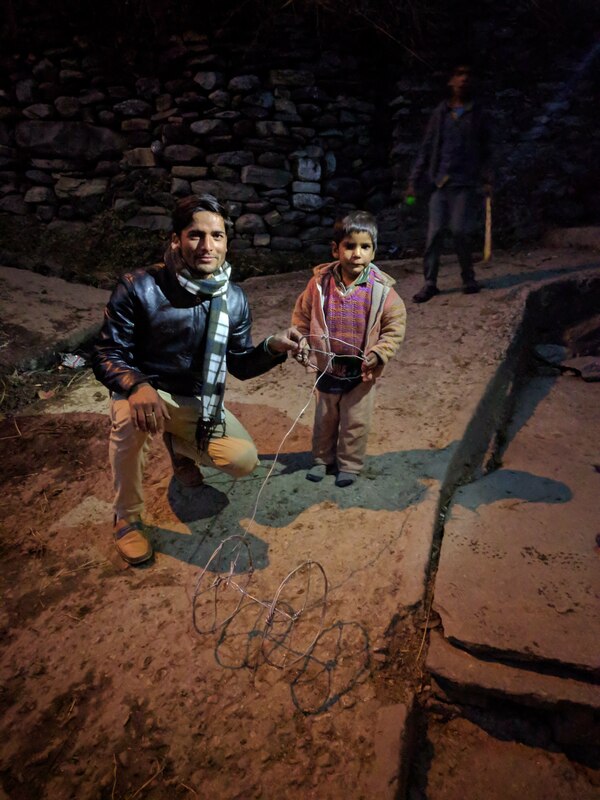 Mahavir with a village kid and his play-thingy. 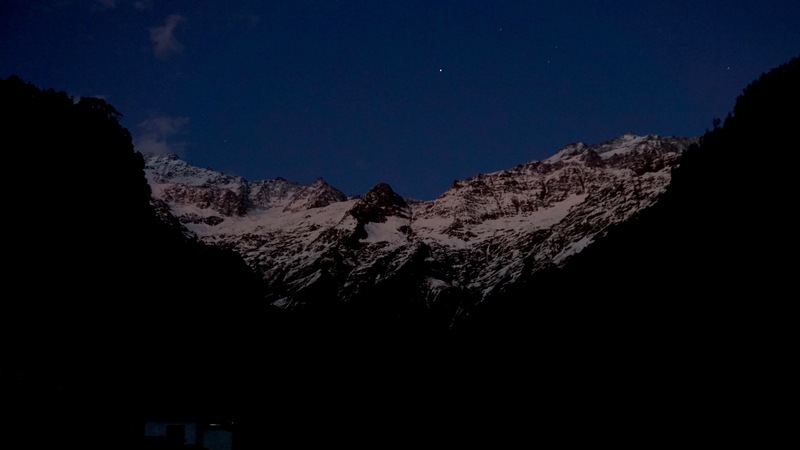 That night, we met the hooch drinking, charas smoking gang of porters again. I grilled one of them for not keeping their promise. His intoxicated responses followed by occasional displeasure made for a somewhat sadistic entertainment. I was sure he wouldn’t remember it either.